Come hang out in the bingo rooms, have fun conversations and play exciting themed games throughout the day for incredible jackpots – Trees, Hibiscus Flower, Moon, Insects…you name it. But wait, it gets better! All games carry a 3TG, 2TG, 1TG EXTRA PRIZE and AMAZING SLOTHY % JACKPOTS that will keep climbing the more players join in the games, allowing the pot to grow slow and steady as big as the number of players who are trying to win it… there really are No Limits! Weekly prizes anyone? At the end of each contest week, we´ll put all participants in a magic hat and randomly select 5 winner (s) or credit the top 5 players with most ranking points depending on the week. Remember, the more entries you collect, the more chances you have to win it. 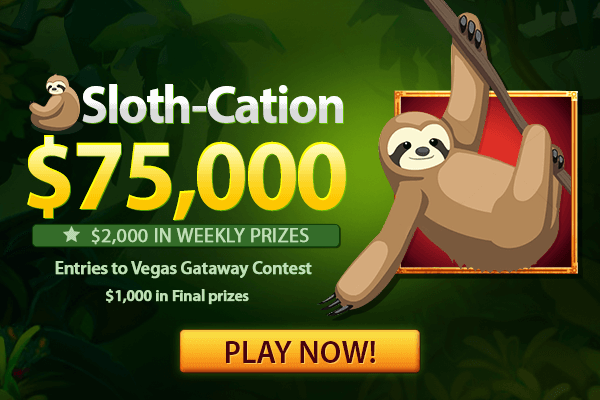 Ready to take part in this Sloth-cation? Sign up today! New members get a $50 FREE trial bonus and new depositors an incredible 1000% Welcome Bingo Bonus Deals. See you all in the bingo rooms! This entry was posted in Blog on Jul 31, 2018 by Canadian Dollar Bingo.